California Tea House has provided me with Organic Silver Needle for the purposes of providing an honest review. 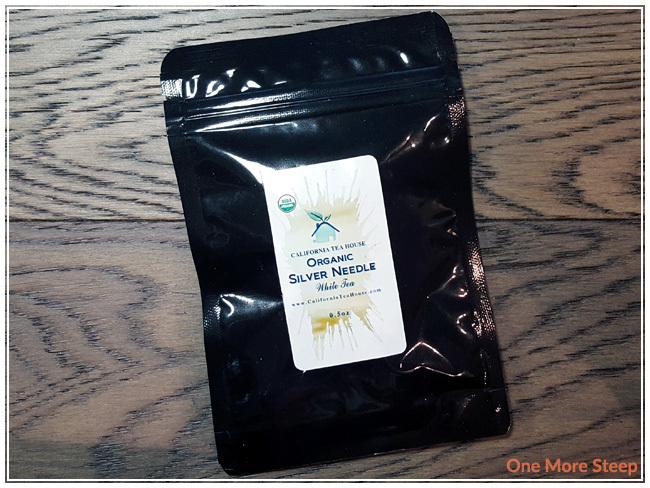 California Tea House got in contact with me regarding trying out a few of their teas, and this was the first one: Organic Silver Needle! This silver needle white tea came to me in a sealed (and resealable!) pouch – opaque on the front and clear on the back so I could see the tea before I even opened the packaging. There were no steeping instructions listed on the packaging, but the URL of the company is included for more information. 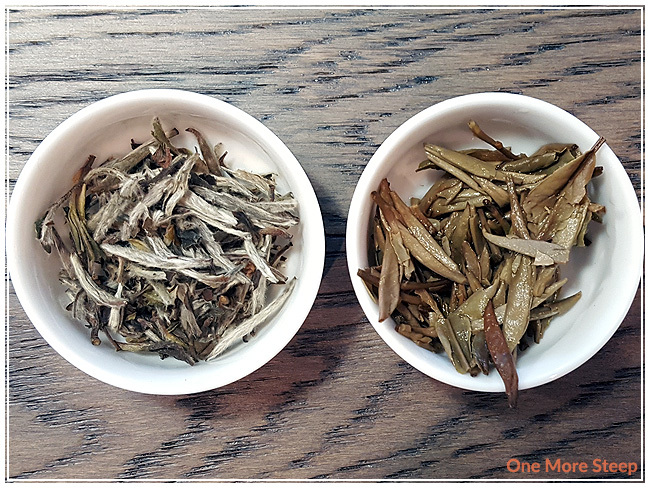 California Tea House describes their Organic Silver Needle as coming from the Fuding and Zhenhe districts of Fujian Province, and says that this white tea is picked between March 15 and April 10 – so specific! As well, this tea is picked when it’s not raining – what a neat detail to include about the harvesting process (and it probably makes it a lot easier for the workers as well). These tea leaves are beautiful! If you’ve never encountered a silver needle before, the tea leaves are long and narrow and covered with what feels like soft, downy feathers. I highly recommend touching silver needle the next time that you can because it’s kitten-soft. The dry leaf has a very subtle sweet, floral aroma to it. 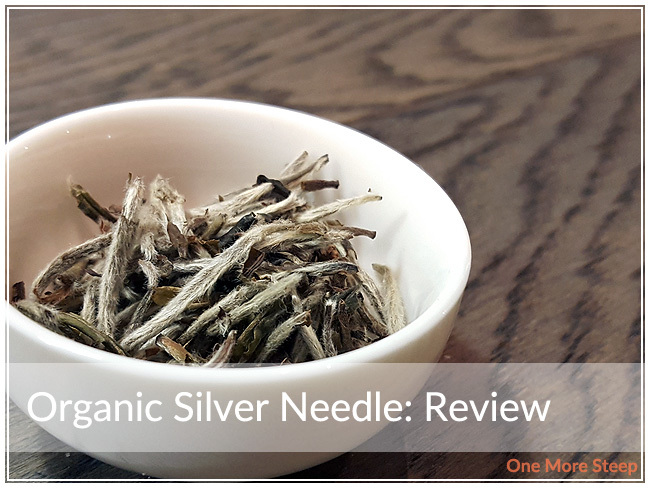 Organic Silver Needle is a straight Chinese white tea. There were no preparation instructions on the packaging. On California Tea House’s product page, they recommend steeping Organic Silver Needle in below boiling water for 3-5 minutes. My initial steep of Organic Silver Needle was in 85°C (185°F) water for 3 minutes. Organic Silver Needle steeps to a light golden yellow after the first three minutes. I found the aroma to be lightly floral. The taste of this white tea is floral and smooth – no bitterness or astringency at the length of time I steeped it for, or at the temperature of water. I found there to be a nice sweetness to this tea, it makes for a pleasant and tasty cup of tea. I resteeped Organic Silver Needle a total of seven times (eight steeps total with the same leaves). 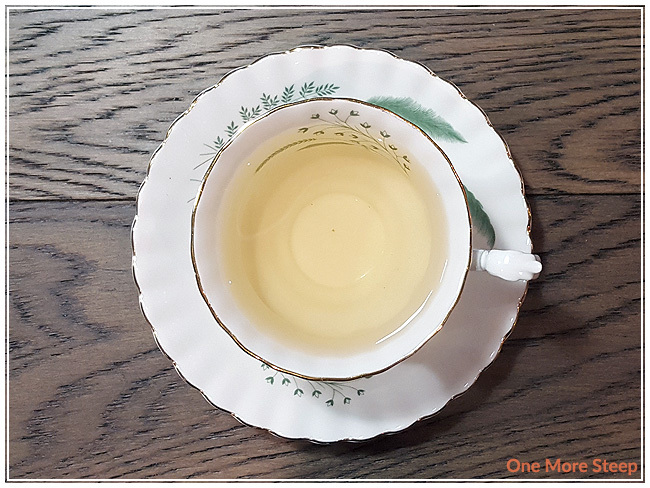 The colouring of this tea became a more golden yellow with each steep, peaking in colour at the fourth resteep. As the colour gets deeper, the flavour gets stronger. The balance of the flavours stays consistent with each steep. I loved California Tea House’s Organic Silver Needle. 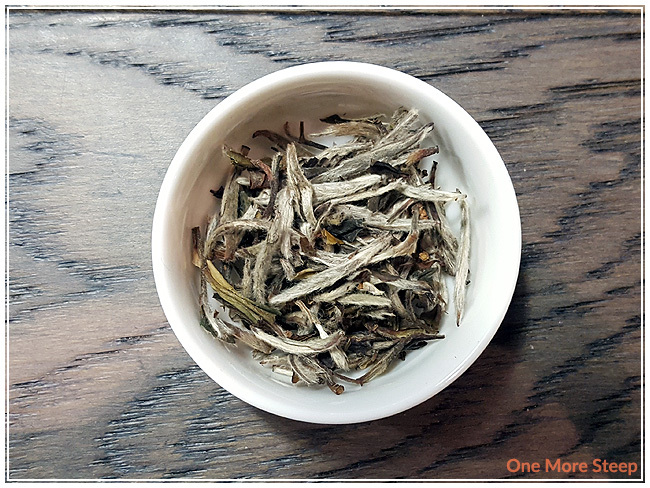 This straight white tea has a beautiful flavour balance, with a nice sweetness to it. The tea itself resteeps well and the tea leaves are lovely to touch and look at. If you haven’t had the opportunity before to try a silver needle, I would recommending trying it. The nice thing about quality straight teas, such as this one, is the ability to resteep over and over again, so you can get a lot of value out of the tea leaves.